Ethan Anderson, the co-founder of TechCrunch50 winner Redbeacon (which was acquired by Home Depot last year), is debuting his newest venture in Los Angeles today — MyTime. In short, the startup wants to be the go-to destination for appointments for local services. Redbeacon lets users search, browse and book local home service providers, including plumbers, roofers, painters and house cleaners. However, while Anderson was at Redbeacon, he realized that there was a lag between when a consumer would request a service and when they would get bids back. Consumers would often drop off during this time. He feels that there needs to be an offering that prevents local service providers from losing people in the conversion funnel. MyTime allows you to find, book and pay for services like car repair, auto detailing, hair styling, massages, acupuncture, and more. As Anderson describes it, he wants to build the Amazon for local services and open appointments. On the consumer side, you can search for an appointment by type of service (massage), category (i.e. health and beauty), date, location and more. All the merchants who are displayed have either a four- or five-star rating on Yelp and/or CitySearch, and their profiles include contact information and descriptions of their services. Once you click on a merchant, you can then drill down into the service you want. So if you’re looking for a massage, you can specify that you’d like a Swedish massage for 60 minutes, and then book the service for the date you’d like depending on merchant availability. MyTime will show you what the prices are depending on the dates (the startup offers merchants dynamic pricing during off times — more on that later). You pay online with your credit card information (this doesn’t include the tip), and simply show up for your service. 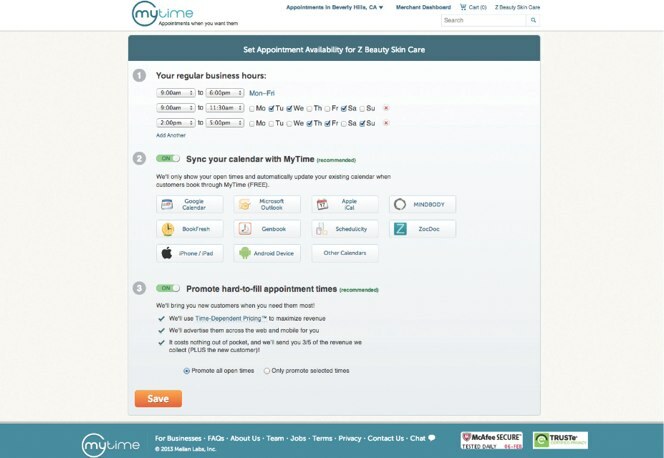 MyTime will also send you a reminder when your appointment is coming up. If you don’t like the service or are unhappy with the merchant, MyTime will give you a guaranteed full refund, says Anderson. On the merchant side, MyTime offers the ability to integrate with 12 different calendaring systems, including iCal, Google Calendar, Outlook and others. Once the calendar is shared, whenever a consumer books an appointment this is automatically updated in the merchant calendar as well. And the merchant can access all the customer data from booked and completed appointments on the backend web app. One interesting feature that MyTime offers is dynamic pricing. A merchant can opt-in to a service that allows MyTime to dynamically change the price at certain times when they don’t have as much traffic (i.e. during the week, in the middle of the workday). The merchant can set a price range, with a floor, and the startup will offer pricing accordingly. In terms of the business model, Anderson says that MyTime offers a freemium model. For free, MyTime will create profiles for a business on the site, but the company won’t promote you on their site and through AdWords, Facebook marketing, etc. The paid model, in which MyTime takes 40 percent of each transaction, includes pushing ads for the business on social networks and Google, as well as the dynamic pricing and promotion of certain appointment times. For now, every service on the site has to be offered at a fixed price by a business. So dentists, trainers and chiropractors can be listed but MyTime won’t list with restaurants or bars. The site currently lists over half a million open appointments for 1,000 businesses in L.A. Anderson has a sales staff who will ramp up expansion to other cities. “There is so much opportunity in local services that we haven’t explored,” says Anderson. “I see this as e-commerce applied to the local service industry.” He adds that while there is no mobile app available at launch, MyTime will eventually expand to include a mobile site and app. Along with the launch, Anderson is debuting a $3 million seed round of funding led by GRP Partners, with 500 Startups, Brian Lee, Jason Calacanis, David Tisch, Greg Badros (who leads advertising engineering at Facebook), Ben Smith (founder of MerchantCircle) and others. It’s important to note that there are a number of startups who are also playing in this space, with some specializing in specific verticals. Thumbtack, and even Redbeacon are competitors, as are StyleSeat (beauty and wellness) and YourMechanic (car repair).